During the early 1860's while the Civil war was raging further east of Missouri there were many battles between the Jayhawkers of Kansas and the Bushwhackers of Missouri. The guerrilla warfare that these two groups used was often bloody and without respect for human life. During these raids only the men were killed and the women were left to fend for themselves. Many towns were destroyed including Lawrence Kansas, which was destroyed by the Bushwhackers and Quantrill's raiders, another ruthless group who wreaked havoc over many parts of the two states. The Bushwhackers and Quantrill's raiders were pro-slavery and often destroyed, stole, burnt and killed men that didn't agree with them. The Jayhawkers were anti-slavery and treated those who did not agree with their position similarly to the Bushwhackers. Several county reports were found about the destruction. In Jackson County from 1861 - 1866 many parts of Kansas City were burned and robbed. The town of Osceola in St. Clair County was burned and most if not all of the men were killed. 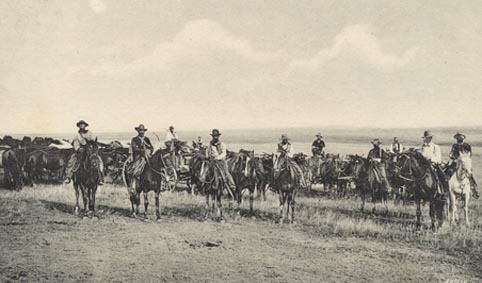 During the early part of the civil war cattle, horses, and mules were taken away from many of the counties. It was estimated that at least four-fifths of the cattle in Vernon County, Missouri, were lost during the war. During the Bushwhacker and Jayhawker raids it was not at all unusual for the farmer's cattle to be stolen or run off. If they weren't stolen, the cattle were sometimes killed. There were similar reports from other western Missouri counties. In Webster County it was stated that their cattle were nearly exterminated during the war.